After a year and a half of dead ends, endless amounts of money, and attempts/ failures at healing my skin, I finally found a diet and skin regimen that actually worked. My nutritionist helped me clean up internally, and Khus Khus Herbal’s SEN Serum, that is infused with Rhu Khus + CBD, Frankincense, Lavender, Rhododendron, and Black Currant Seed Oil brought my skin back to life. These Ayurvedic and Western botanicals mixed with the endocannabinoid healing power of European Eco Certified CBD oil completely clear up my skin. No more bumps, no more redness and even the brown pigmentation on my cheeks began disappearing. Now nearly a year later and still using the serum, my skin remains clean and clear. I rarely wear makeup and I actually feel comfortable in my own skin. 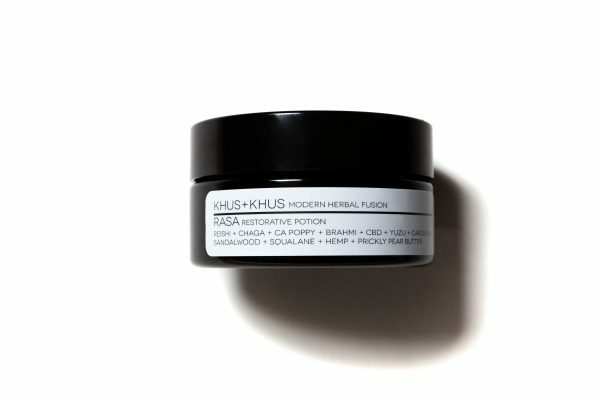 I am endlessly grateful to Khus Khus for their pure, powerful and healing products and felt the the need to spread the word. This stuff literally saved my skin. This is the best I tried several serums before this is the only one I can use on my sensitive skin. LOVE this serum!! Just wonderful great for everyday use cleared up my skin it just looks brighter. I and new to green beauty but this serum works wonderful on my dry skin, I have very sensitive skin, probably because of the harsh products I was using. But what a difference my husband says I look 5 years younger. My sisters and I have always struggled with acne growing up using harsh chemicals was never fun. Having a product that helped my acne and is green left me feeling so good inside and out. It worked so well I bought my sisters a bottle! My sister who is a green beauty junky told me I had to try this product for my acne. Well big sisters do know best! After trying the SEN my face felt smooth from the combination of herbs and CBD. My face seriously reacts so well that my acne has subsided and feels great using this everyday. Thank you Khus+Khus and Thank you Sis! I’ve been taking CBD internally for years the benefits I’ve found are amazing so when I went searching for beauty products that had CBD in them it was challenging. My friend told me about Khus+Khus and told me to check out her IG after looking it over I went to the site and found the SEN as well as the COPIOUS. All I can say is OMG both these product are amazing the combination of not only the smell but the feel of how it leaves my skin is amazing. I now have a CBD regiment that not only includes my internals but also my topical that leaves my body feeling GREAT all day everyday! After finishing my yoga class I did my regular routine of showering and getting ready to go out with the girls. When I was blow drying my hair I see one of the girls putting on this oil on her face next to me. Not one to miss out on something I asked her about it and she gave me some to try on my face. After putting it on it left my face feeling smooth and refreshing I snapped a pic of the bottle to look them up later. Well not only did I buy a bottle of the SEN the next day all my girlfriends who went out with me that night kept asking me what I had on also got turned on to K+K. One of the BEST finds I’ve maid this year! I love going out and enjoying the outdoors one of my all time favorite things to do. What I don’t enjoy is the byproduct that comes with it of dry skin and sun damage. Sen Face Serum is my traveling beauty-medicine all around outdoor traveling companion leaves my face refreshing and smooth I have two bottles one in my bag the other at home. OMG…this product is fantastic. As an African American I can honestly say this is the best product I ever used on my face. I recommend this to everyone I know. My skin looks 10 years younger in just 1 week. If you don’t believe me buy this product & it will make a believer out of you! Oh yeah! LOVE to hear this! So wonderful!! Hands down this serum saved my skin! Game changer! I have suffered with acne since 14, this is by far the BEST serum I’ve ever used I can’t go without it, internally grateful. I love this serum! Light, effective and clean. I just changed my whole skincare game form toxic to nontoxic. My friend told me to try this serum. My skin actually looks different in just over a week. Stop looking for that face serum, this is the best serum out there hands down! I can’t believe how good it is, totally changed my skin! 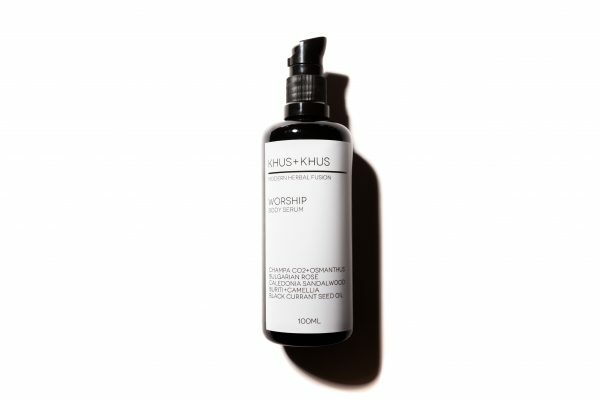 I don’t know what KHUS+KHUS is doing to make their serums so good but I almost don’t want to share with anyone. Just purchasing my second bottle, this product completely delivered for my skin. The hormonal changes in my skin that I typically experience month to month are noticeably diminished and my complexion was more radiant after just few uses. I use this with the detox hydrolat and am so happy with the results. I’ve recommended it to a ton a girlfriends and you should grab one too, it’s SO good! Also, I use it with a $10 micro roller that I found on Amazon and my wrinkles are less noticeable as well! Don’t plan on changing up this routine any time soon, because it’s worked so well. I received a sample of this with my last order and was surprised by the results. I use a few high end organic serums but feel like this might be the magical product that is calming my skin. My skin feels smoother and I think some of the redness decreased after a couple of days of use. I’m now curious to try the other serums and will be ordering the sampler set soon. Thanks! Well wonderful Lauren, love to hear that and thank you for taking the time to write such a lovely comment. The SEN Face Serum, is pure magic. It keeps my skin plump, and clear. I use it 3x a day. My skin has always been flawless, so I use this as a preventative and it works superbly. The smell is perfect not too strong and very subtle as well. It looks like liquid gold and goes on so velvety. Works with circulation very well. I’ve used it for about a year almost and will continue to do so. I am absolutely obsessed with all of Khus + Khus serums; I started off with the Sample pack – picking a favorite leaves you feeling guilty, like you’ve chosen a favorite child, but twist my arm and I’ll say the Sen is without a doubt my go-to. I’ve had skin problems all my life – nothing major, but I sweat a lot and regularly have oily skin, but the next dry day I’ll have flakey skin. It’s tough to find one product that meets the needs for my versatile skin – I’ve seen many dermatologists and had Differin and other prescriptions – but my new regiment is to use a Serum before I go to bed and when I wake up in the morning. I’m really, really satisfied with the results; my skin is noticeably and reliably clearer, which translates into me having more confidence in my day-to-day. I love these Serums – I’ll definitely buy again. Thank you, Katie! This is wonderful so happy to hear this and thank you for taking the time to write such a thoughtful comment.